Complainant Steven Magritz did not file a "Civil Cover Sheet" for several reasons. 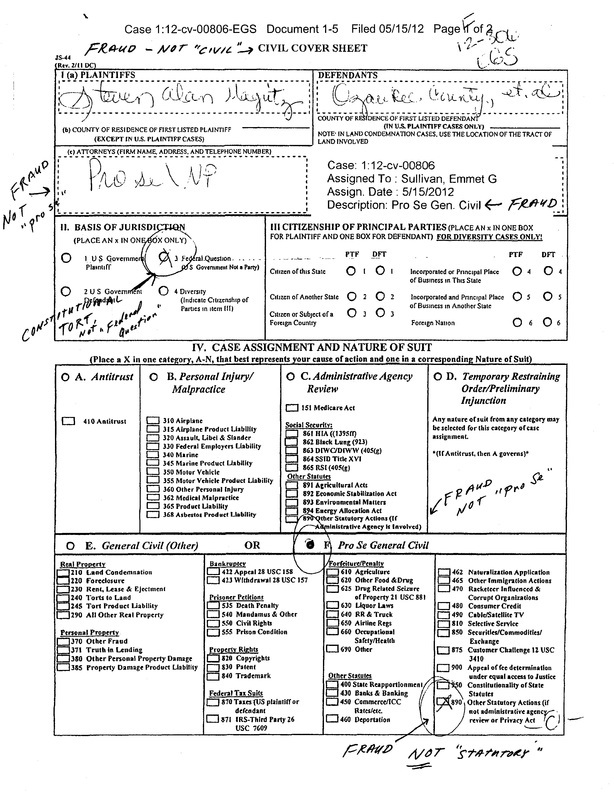 First, the suit was mailed to, and was supposed to be filed in, the district court of the United States in Washington, D.C. Notice that this "Civil Cover Sheet" does NOT indicate the name of the court, that is, WHICH COURT is this case filed in? The District of Columbia, the 10 square miles consisting of the seat of the federal government, has many, many courts. Someone in the District of Columbia court system transferred the Magritz suit from the district court of the United States to the United States District Court (a different court) without the knowledge or consent of Magritz. The Magritz suit was filed with, and was to be ruled upon in, one of the courts reserved to the people which does not display the the military flag of the United States. The Prettyman Building at 333 Constitution Avenue was reported to Magritz by witnesses with first-hand personal knowledge to be the only Courthouse in the United States which has courtrooms reserved for natural people. These courtrooms were observed to not display the United States military flag. This is important because the flag represents the jurisdiction of the court, just like ships at sea fly the flag of a given nation. There is nothing on a "Civil Cover Sheet" that is applicable to a suit brought in Equity for Breach of Fiduciary Duty by a Public Officer. Complainant Magritz did not file the suit "Pro Se". Complainant Magritz did not file any "statutory" suit, but rather a suit brought under the authority of the Constitution. Complainant Magritz did not file a Title 42, Section 1983 Civil Rights Case. Complainant Magritz did not authorize anyone to prepare a "Civil Cover Sheet". 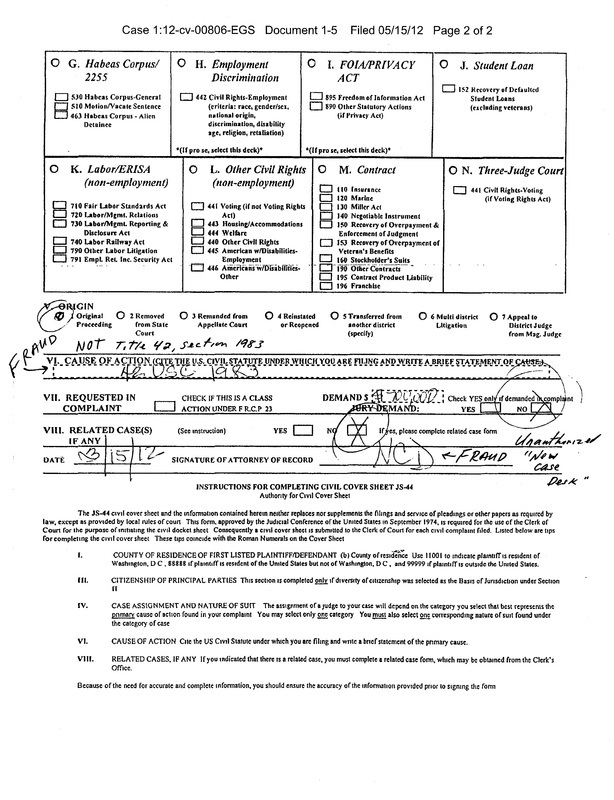 The "Civil Cover Sheet" was prepared by an Unknown Named Person who did not want to be held accountable for filing the fraudulent Cover Sheet and therefore did not sign it, but rather wrote "NCD" on the signature line, allegedly meaning "New Case Desk". Complainant Magritz had given proper ADVANCE NOTICE TO THE CLERK by way of two (2) writs of Praecipe, neither of which were posted on the Court website, therefore the preparation of the Fraudulent "Cover Sheet" was INTENTIONAL, and meant to cause an injury. Go to Magritz's Non-consent to Fraudulent "Cover Sheet"